The first female president of an elite New England college grapples with student protest in this satirical novel. ...a sharp and insightful novel exploring the current explosion of student discontent ... Ms. Korelitz hits on a trenchant observation about the nature of contemporary activism: Its object is not resolution but renown ... The Devil and Webster is very much Naomi Roth’s book. In the midst of the furor, she undergoes a midlife coming-of-age, completing the switch from a person committed to challenging the rules to one whose duty is to enforce them. A satire succeeds best when it exaggerates a system or idea into absurdity, and as Korelitz skewers all things academic, her ultra-long sentences can be quite funny ... However, writing a successful satirical novel is more difficult than creating a satirical TV show or comic strip. Those short forms get in, make a point, and get out. A novel is extended and requires interesting characters that the reader can root for...Unfortunately, here, The Devil and Webster is lacking. Many of the characters are simply talking heads, on the phone or at meetings ... the novel is long in getting to the point. As the crisis grows in the background, characters, some who never appear again, are introduced. The entire history of the college is told in endless paragraphs ... Our modern universities surely offer fodder for great satire, for a story of fascinating characters engaged in ridiculous but well-meaning actions (think Jane Austen). Unfortunately, this is not the one. 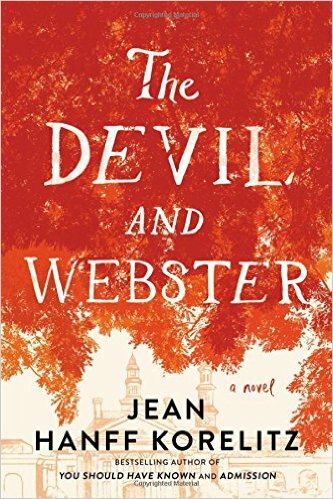 The Devil and Webster, while intelligent, is an underwhelming contribution to the genre ... it lacks the intellectualism of the best campus novels ... Naomi's inner world — her story and friendships — could make up for some of this lack of theoretical heft, but as a character she's flat, blindsided by easily predictable events, and the relationships that take up much of her attention aren't well-developed ... The Devil and Webster is a suggestive exploration of what tolerance, inclusion, and identity mean, but the nuance stays submerged in that ideological swamp. What did you think of The Devil and Webster?